I’ve recently found this incredible website online that is a perfect fit for keeping the storage items in your pantry chock full. The application is called “Alice” . The way that Alice works is that after setting up a free account, you specify what you typically buy (choosing from a list of 1000’s of products) and then the program goes to work. 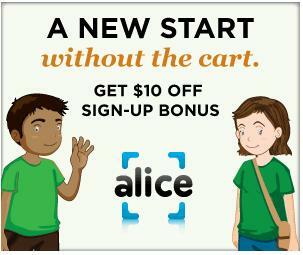 Alice organizes all your products based on how frequently you use them, finds coupons and other deals and then sends you alerts when it determines you are running low. It also keeps track of all your expenditures, categorizing and showing you where you’re spending the most of your money. On top of this, the shipping is free! You might think that since the shipping is free that the prices of the products are more expensive. On the contrary, since the site works directly with the suppliers, it eliminates the middleman — effectively keeping the prices low. From what I noticed, overall the prices are cheaper than the supermarkets (at least where I shop). Since Alice is still currently in Beta mode, the down side is as far as food items go, there isn’t a complete list — although they are continuing to add to the list (which by-the-way they gladly take suggestions for products) . The great part about these items is that most of them store fairly well (1-2 years) and don’t require a refrigerator which is perfect for food storage. 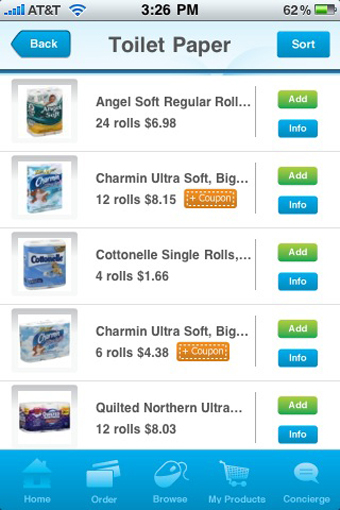 For you iPhone users (like me) Alice also has a free app that allows you to not only order and maintain any product from your list but also gives you the ability to scan bar-codes from items that are running low in your pantry. These can be simply added to your cart for easy reordering. Alice is extremely useful for those of us who use a pantry system for food storage. Our family has about a years worth of long-term food items (good for 20+ years) but beyond that we also have a 3-month supply of constantly-rotating commonly used food (and non-food) items. Alice seems to be a perfect fit to help keep those items in stock (all without having to go shopping!). I can simply go downstairs to our basement with my iPhone look for those products that we are running low on and scan the bar-code. It will then enter into my Alice product list and I can send away for it. Around 2 days later it arrives at my home. Again, keep in mind that you don’t need an iphone to use the web site. Once you’ve set up your master shopping list, using it over and over and ordering is as simple as a click of a button. Alice reminds you when you are running low on products based on the average timelines of consumption as well as find coupons and deals for you. You don’t have to worry about constantly checking out your inventory. Now if Alice could only rotate the actual food items in my pantry it would be the ultimate service! Thanks for introducing me to Alice. I really am enjoying your website. You’re welcome. It’s a great service, so enjoy!